Iris recognition is one of the most accurate biometric technologies. In IREX IV the National Institute of Standards and Technology (NIST) evaluated 66 iris recognition algorithm prototypes from 12 commercial organizations and academic institutions in large-scale identification task. Similar to all previous IREX evaluations Neurotechnology iris recognition technology shown one of the most accurate and fastest results among evaluation participants. NIST accepted submissions into two classes: Class P – optimized for lowest number of false positives, and Class N – optimized for lowest possible number of false negatives. 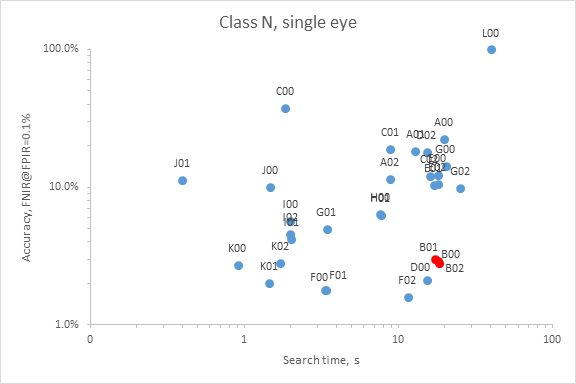 In Class P, 1.6 million single-iris test Neurotechnology submission was the only capable of returning search results in less than 0.5 second without degrading iris recognition accuracy. This demonstrates the capabilities of the accelerated iris matching engine. 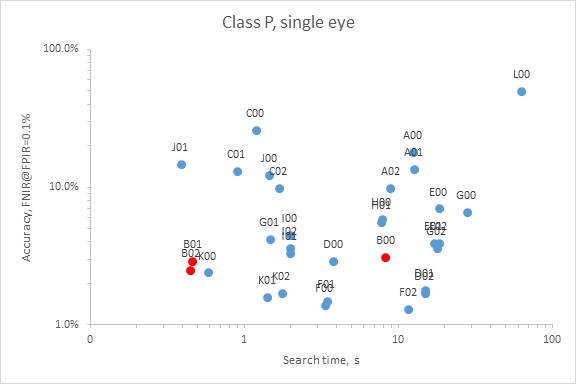 Distribution of search times when single-eye templates are searched against an enrolled population of 1.6 million. Neurotechnology submissions B02P, B01P, and B00P are denoted with red color. In Class N test Neurotechnology did not use accelerated iris matching. The submissions mostly tested different iris segmentation strategies. Neurotechnology submissions B02N, B01N, and B00N are denoted with red color. In all tests, Neurotechnology submissions accuracy were among top 4 participants. See also the full IREX IV report – part 1 and part 2.